Montepulciano is a walled hill town in Tuscany, built on a sloping and narrow limestone ridge in the heart of the Vino Nobile wine growing area. 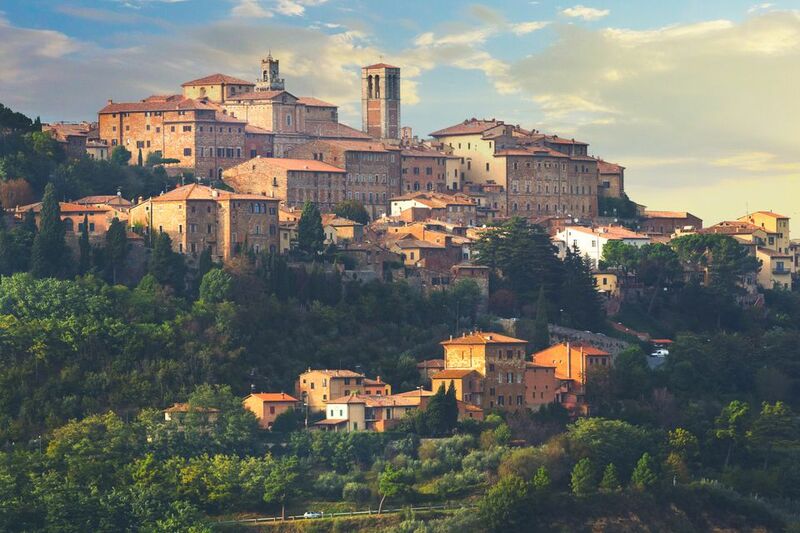 It's the largest hill town in southern Tuscany and is known for its impressive central square, beautiful Renaissance buildings, churches, and views. Montepulciano is in southern Tuscany (see this Tuscany map), in the Val di Chiana just east of the beautiful Val d'Orcia. It's about 95 kilometers south of Florence and 150 kilometers north of Rome. Montepulciano is on a minor rail line and the small train station is a few kilometers outside of town. Buses connect the train station with the town. Hourly buses run from Chiusi train station, on the major rail line between Rome and Florence and probably more convenient, to Montepulciano. Buses also run to nearby Tuscany towns like Siena and Pienza. Note that buses may not run on Sundays. From the bus station, you can walk into the historic center or take the little orange bus. The center is closed to traffic except by permit so if you're arriving by car, park in one of the lots on the edge of town. The closest airports are in Rome and Florence, see this Italy airports map. There are also some flights into Perugia airport in Umbria. Hotel La Terrazza is a 2-star hotel right in the historic center. Panoramic is a 3-star hotel outside town with a rooftop terrace, swimming pool, garden, and shuttle bus. If you'd like to try an agriturismo (farmhouse), there are several near town. San Gallo, 2 kilometers from town, has three apartments and three guest rooms. Piazza Grande, the main square, is one of the most impressive in Tuscany. The piazza is surrounded by 15th-century buildings including the town hall, clock tower, and duomo as well as cafes and a wine tasting shop. The square, crowning the town, is reached by following the long winding street called the Corso up the hill from Porta al Prato, one of the ancient gates. Town Hall: Palazzo Comunale is a Gothic style building with a 15th-century tower modeled after Florence's Palazzo della Signoria. From the tower, there are magnificent views of the town and surrounding countryside. City Walls, designed by Antonio da Sangallo, were built in 1511. Cathedral, the duomo, or cathedral, dates from the early 17th century. The plain facade is unfinished. Inside is Taddeo di Bartolo's Assumption of the Virgin triptych painted in 1401. Madonna di San Biagio Church, below town, is a pretty Renaissance church. Sangallo worked on the project from 1518 until his death 16 years later and it's considered to be his masterpiece.